I usually avoid these blockbuster shows but occasionally it seems that the judgement of the majority, or of the mainstream, is correct. I worry that these shows will give me to much to digest or show me things that were never meant to be seen together at once. Not fond of the crush either. All of those things were true about this show. Nonetheless it was a worthwhile pilgrimage. The show was a generous mix of paintings, drawings and prints. I struggled with the many stages of the various prints which felt laboured and penitent almost, almost like multiple layer comps in Photoshop but taking exponentially longer to do. A lot of them seem to get darker and darker as they go on. The end results are dramatic, and excellent in their way, but static in comparison to the drawings because they have been fixed firmly into position by multiple iterations. 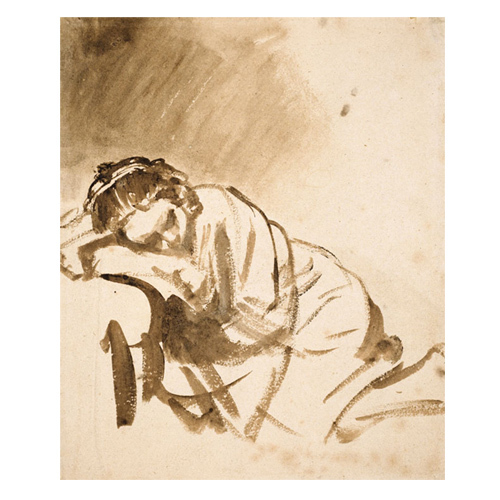 Whereas the drawings are free – nothing is fixed until it is all over, and even then…There is a spontaneity about Rembrandt’s drawings that captivates. As strong as Michaelangelo, and as fluid as any Chinese brushwork – his drawing is unsurpassed. For example this ink study of a woman – the cover of my old Thames & Hudson book of Rembrandt drawings – probably took him under five minutes. Such infinite precision, in a few movements of the brush, is a window to a moment. The distant past is a dark place. Often it is hard to remember that people then lived as people now, with rich distinct lives with individual dreams, loves and disappointments. Occasionally the work of an artist can be like a beacon of light in that darkness – can briefly show us what life was then, and is now. The show starts with a room full of late self portraits: some of the very greatest of all paintings. These pictures seem completely modern, yet they were painted thirty years before the birth of J. S. Bach and only forty years after the death of Shakespeare. 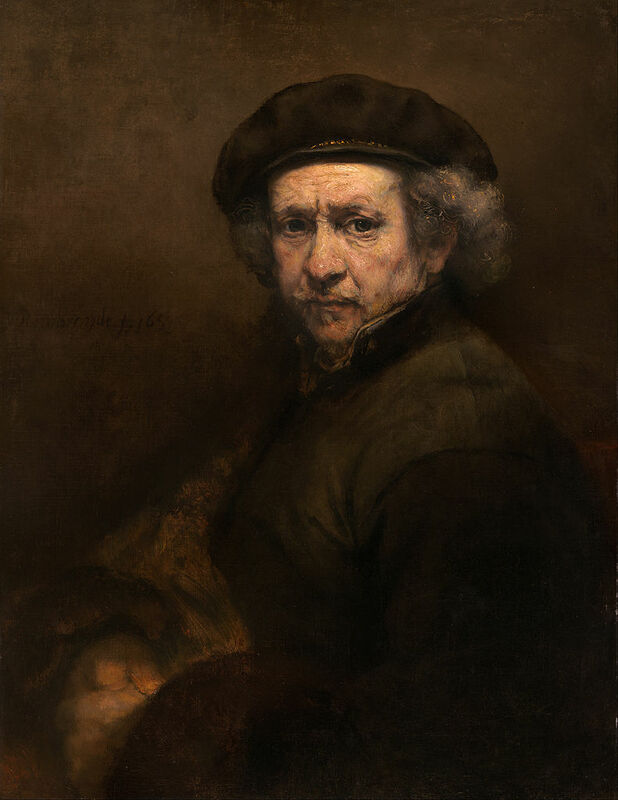 It is not simply a question of ‘realism’ in the treatment of light and form, it is the abandonment of pretence – to look into the eyes of one of Rembrandt’s late self portraits is to look into his life. Like looking into the face of a friend – feeling empathy, a connection, but never entirely knowing what they are thinking and feeling. That distance made real is an implicit acknowledgement that the other is human as we are, they think and feel as we do and they are not mere shells of appearance. That is rare to find in art. They are so powerful, so present in fact that they mask the shambling dead wood of the crowd. When you are connected to their gaze you are alone in the room with Rembrandt. How does he make them so great? In this show there are some old friends from the National Gallery’s own collection and the great self portrait from Kenwood House (at the top) and some new ones – this one from Washington in particular held me. I have thought about the source of their power for years and still it is not entirely clear – they seem to have simplicity and complexity in equal measure. The composition is deceptively simple – but completely correct. Everything is in balance. The fluid or indistinct treatment of certain areas allows the eye to rest on the face and apprehend its expression. In his focus Rembrandt anticipates photography – still two hundred years away. 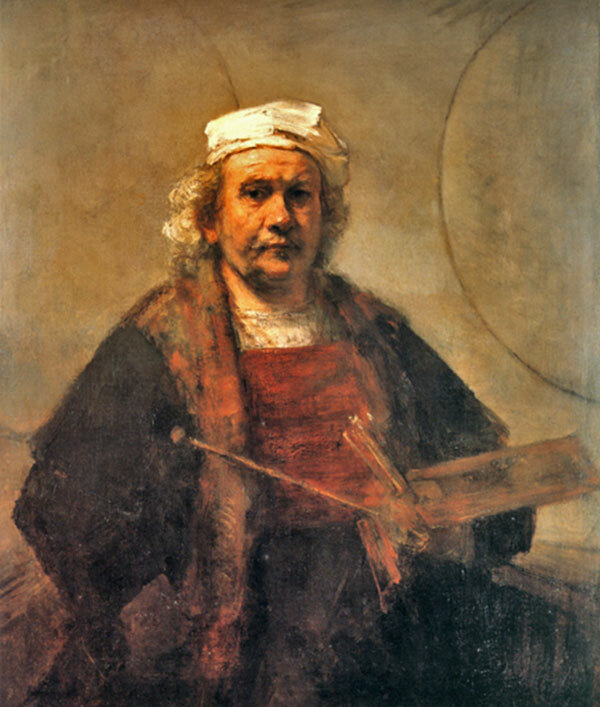 Intuitively Rembrandt focuses his energy and our eyes on the bits of the face we most want to see – not the background, not the hat, but the actual face through the mask of time, of his clothes of his age. He allows light into his pictures only to illuminate what he chooses. The light that comes out of the pictures carries an echo of his soul that remains with the viewer. This entry was posted in Art, Galleries, London, Painting, Uncategorized and tagged Art, Drawing, drawings, Galleries, Hampstead Rembrandt, Light, London, National Gallery, Painting, Rembrandt, Self Portrait, the National Gallery. Thanks Gigi! Glad you enjoyed it…if you do become a snob I’m sure it would only be the best kind! This post is such a delight…lyrical, intriguing…compelling us to look at the painting(s) again and again. I’ve recently “rediscovered” Rembrandt and am puzzling over his particular magic, too. Your words came along at the perfect time to help and inspire me. Thank you for sharing this!! Thanks! It’s been a while since I really looked at paintings of Rembrandt’s that I hadn’t seen before and it has brought all his work back to life for me.